Small and medium-sized enterprises (SMEs) are the bloodline of economies but most face the challenge of access to finance. 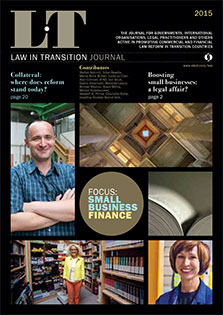 This latest issue of Law in transition examines the support that can be given to the SME sector to foster its growth, and the role that legal and regulatory frameworks can play to promote SME development. Foreword: Boosting small businesses: a legal affair? Collateral where does reform stand today? Стимулирование процессов развития малого бизнеса: проблемы права? Обеспечение сделок: Положение дел С реформами сегодня?